Remember when Vine was cool and Snapchat was dirty? How quickly their fortunes have changed. Vine, once the darling of visual storytellers, is losing brands and attention, sinking in popularity on the app store. Meantime, Snapchat has overcome its reputation as a fringe app run by a badly behaving frat boy. Adweek recently named Snapchat the hottest digital brand of the year for 2015 while Vine was making headlines for losing market share. Their changing fortunes demonstrate how easily the disruptors can become the disrupted. But the story ain’t over yet. Vine came along at the right time. The app was officially launched in January 2013 amid the rise of video storytelling. Brands, always looking for fresh content sharing platforms, latched on to Vine as a fresh alternative to YouTube. Vine’s format for sharing 6-second video stories seemed like a natural fit for a multi-tasking world with a shrinking attention span — and, crucially, Vine was (and remains) an easy-to-use mobile-first app at a time of rapid mobile adoption. Its user base grew rapidly, and Vine was hailed as a YouTube disruptor. Brands eager to extend their presence into mobile content, began adopting the app and bringing with them more users. By fall of 2013, Dunkin’ Donuts and Trident Gum were launching the first-ever TV spots using Vine. But even as Vine was ascending, a multitude of forces were converging to disrupt Vine’s success. Just six months after Vine launched, Instagram rolled out its own video feature, with superior editing capabilities, Facebook would also beef up its video-sharing capability. Snapchat, which had existed longer, added more functions, exploded in popularity, and, in 2014, introduced advertising (while Vine did not). Facebook could wield its scale and targeted advertising effectively against Vine, and Snapchat had coolness in its favor. Meantime, YouTube kept evolving as a premier source of online entertainment for brands and YouTube stars such as PewDiePie. By the fall of 2015, video analytics firm Tubular Labs was reporting that brands were ditching Vine. Only 13 of bellwether 40 brands such as Coca-Cola had posted Vines during the third quarter of 2015, whereas 21 had done so in the first quarter. General Electric and Mountain Dew had left their Vine accounts untouched for months. But it’s premature to say Vine is dead. According to comScore, Vine was delivering as many monthly unique visitors as Snapchat in 2015. Big names such as Lowe’s and Puma continue to create content, as does First Lady Michelle Obama to promote social programs. These mostly young creative-types produce an enviable stream of short videos, ranging from the artistic and musical to one-liner, sketch-comedy-like micro-skits. The top personalities are wildly popular, tend to collaborate with and reference each other often, and have come to define a big part of the service. I like how Vine General Manager Jason Toff describes Vine as an entertainment network, not a social media platform. Internet celebrities such as Dallas Cameron are doing more to generate buzz for Vine than Vine is. A repositioning around branded entertainment would suit Vine well. Even though YouTube, as noted, has evolved into a provider of digital entertainment, there is plenty of room for a challenger brand. But even though Vine remains an easy app for creating short-form video content, the platform must create an advertising model (and it sure would help if Vine’s owner, Twitter, could figure out a way to capitalize on this asset). Right now, Vine does not do advertising. All those self-made celebrities are making money off Vine, but Vine is not making money off them. Jason Toff recently told Re/code that advertising is “not our focus right now.” If not now, though, when? Snapchat has succeeded by capitalizing on the emotional appeal of scarcity. Share with me a cool photo or video, and I might check it out when I have time. But share with me a cool photo or video that expires in 24 hours, and suddenly I want to see what you have to offer. Scarcity is the very reason people endure miserable weather and long lines for door buster sales on Black Friday. Couple the appeal of scarcity marketing with the right demographic — I’m talking the millennials and digital natives who hang out on Snapchat — and it’s easy to see why Snapchat is one hot commodity for brands to hang out, too. But Snapchat earned its popularity by being willing to change itself to be more appealing to both consumers and brands. For instance, Snapchat launched video chat in 2014, thus strengthening its user base with video to go along with photographic snaps. Snapchat also opened itself up to ads in 2014 and created features that appeal to brands, such as Discover — an area for ad-supported branded content — and Live Stories, or curated streams of user-generated content clustered around an event such as a concert or sporting event, which is naturally appealing to brands wanting to create event-based content. Brands ranging from Burberry to Sprite have responded by flocking to Snapchat. The NFL uses Snapchat to share video content such as game highlights through Live Stories. During the holiday shopping season, Target cobbled together a multi-media holiday campaign that included Snapchat, Facebook, and Instagram. On Snapchat, users could use a special geofilter (like a digital sticker available in a limited number of places) to overlay branded holiday-themed graphics on their Snapchat content. According to NFL Vice President of Digital Media Vishal Shah, NFL Live Stories have been reaching more than 10 million Snapchat users on Sunday game days. “These are TV-sized audiences for each individual posting,” Shah commented in 2015 when the NFL jumped into Shapchat. Brands are also using Shapchat as a direct-response mechanism. On National Coffee Day last year, Dunkin Donuts generated foot traffic to local Dunkin’ Donuts stores by offering free cups of coffee to users who clicked on a special geofilter of raining coffee beans. To enjoy the deal, users had to be inside or near a Dunkin’ Donuts outlet. In 2016, I believe more businesses will borrow a page from the Dunkin’ Donuts playbook and use Snapchat for direct response marketing with measureable results such as an increase in foot traffic and sales. Meanwhile, Snapchat is taking steps to address a major vulnerability: it’s an expensive place to advertise (costing as much as $750,000 for brands to place ads), and yet Snapchat doesn’t provide much audience targeting in return. Snapchat knows it has to become a data powerhouse to justify its rates, which is why Snapchat has been creating better audience segmentation abilities as well as an application programming interface (API) that enables advertisers to buy ads with better precision and frequency. The rollout of an API will help Snapchat become a more effective direct-response platform because brands will be able to target ads with calls to action more effectively to different demographic segments and measure the results. As the Eagles once sang, they will never forget you ’til somebody new comes along. Vine was hot until somebody new came along and offered a better experience. 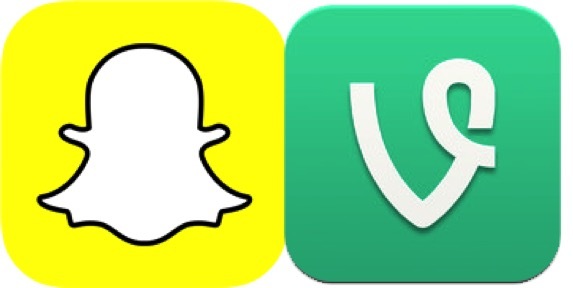 There will always be another hot new app around the corner to challenge Snapchat, just as Snapchat challenged Vine. Just a few weeks ago, the playful Peach app launched with great fanfare (ironically, Peach was created by Vine Founder Dom Hofmann). Snapchat has established itself as a strong branding platform and is now pivoting into ad tech, as it must. Vine is just holding down the fort. My money is on Snapchat for being willing to continuously change itself instead of waiting around to be disrupted. This entry was posted in Digital and tagged Adweek, Burberry, Dallas Cameron, David Deal, Dom Hofmann, Dunkin' Donuts, Jason Toff, Logan Paul, NFL, Peach, PewDiePie, Quartz, scarcity marketing, Snapchat, Sprite, Superhype, Tubular Labs, Vine, Vishal Shah, YouTube. Bookmark the permalink. Snapchat is also an interesting phenomenon from the usability/UX standpoint doing everything different compared to well known apps. I wrote a blogpost a year or so ago about how to use the live video function Snapchat added at that time. Turned out lots of people where looking for a guide on how to acutally use it telling from the traffic i got on that post. The snapchat.com page is still an icon for itself. Regarding Vine – it also seems that lots of people got attracted to animated GIFs right after Vine was around. Also, the sound on most amateur vines is just noise.